The 2011-2012 Broadway season will be remembered for a pyrotechnic display of bravura performers; the year Stephen Sondheim rattled Broadway with a punched-up version of Porgy and Bess; the year James Corden beat out Philip Seymour Hoffman, Frank Langella, John Lithgow, and James Earl Jones for Best Leading Actor in a Play at the Tony Awards; the year bittersweet Irish love story Once touched so many hearts; and the year without a season blockbuster, unless you count Hugh Jackman’s solo show, which was so sold out that producers passed on the opportunity to be nominated for a Tony so they could sell more seats. (Jackman was given a special Tony anyway.) This season did not have a new Book of Mormon, Jersey Boys, or The Producers, which is not to say that Broadway didn’t sell a lot of tickets. In fact, this year broke a new record with $1.14 billion in overall gross sales for the season. And through all of this, The Playbill Broadway Yearbook (Playbill Books/Applause Books) has been busily poking its nose backstage to photograph the denizens of Broadway and to let them report on their activities. Using the style of a high school yearbook as inspiration, Playbill Books—a division of the iconic 128-year-old company that designs the programs for every Broadway show—has created the ultimate Broadway scrapbook. 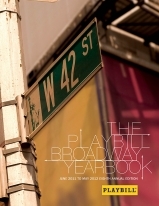 The Playbill Broadway Yearbook gives theatre fans everything from a comprehensive record of every person involved in every show of the season (leading ladies and costume interns alike), to revealing interviews that give readers an all-access pass to Broadway’s backstages. At least one member of the cast or crew from every show reports on things that only those who were backstage would know: opening-night presents, daily rituals, celebrity visits, memorable ad-libs, and more. Robert Viagas is the founder of Playbill.com, host of Radio Playbill, editor of Louis Botto’s At This Theatre, and author of books including I’m the Greatest Star!, The Alchemy of Theatre, The Back Stage Guide to Broadway, and On the Line: The Creation of A Chorus Line. He is available for interview. The assistant editor is Amy Asch, archivist for the Oscar Hammerstein II and Jonathan Larson estates.